Due to its massive size and weight when loaded with camera gear, I am no longer using the Tamrac 619 as my daily-carry bag. Last year I wrote about switching to the Tamrac 619. It served me pretty well until one day when it nearly broke my back. The Tamrac 619 is a huge bag. Like everything from Tamrac it is constructed from tough, high-quality materials, and designed to last a long time. Unfortunately for me, my eyes were bigger than my stomach (shoulder?) on this one. Fully loaded, the 619 weighed in at almost 40 lbs! Way too much to wear on my shoulder every day. After I nearly threw my back out, I went down to Samy's to peruse their selection of camera bags. I needed shoulder bag that provided quick access to my camera, had room for a couple of lenses and had a padded laptop enclosure to fit my MacBook Pro. Up until this point I had sworn by Tamrac bags, but they just didn't make one that I felt really good about carrying around every day. After looking around I found the super-tough and non-camera-bag-looking ThinkTank Urban Disguise 50. 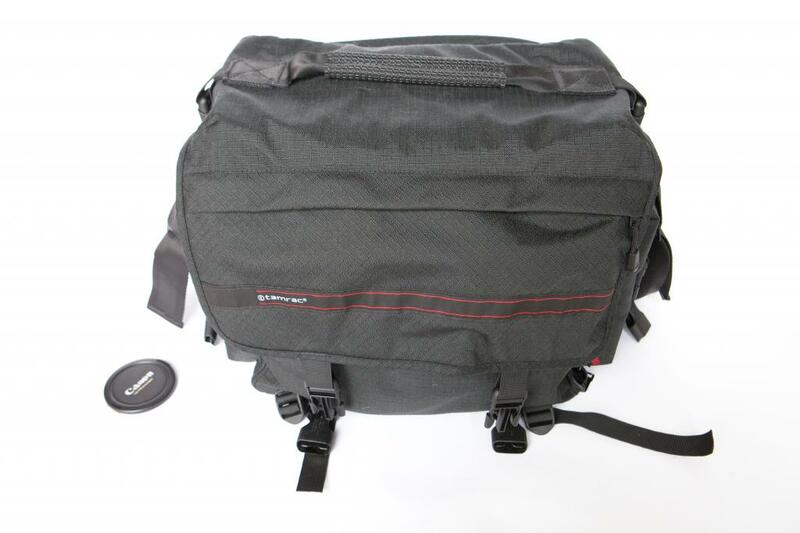 The ThinkTank bags are designed to not look like camera bags. The Urban Disguise 50 looks just like a laptop bag, but has some really nice features. Obviously it has room for cameras, but it also has lots of nice pockets for various gear and accessories, a laptop sleeve, a super-comfy shoulder strap and an integrated rain fly. The guys are ThinkTank really went all out with their design, including unique features like a hidden pocket, super-tough ballistic nylon and YKK zippers. I love this bag and will likely devote a post to it for a more thorough review at some point. The Tamrac 619 is a well-constructed bag, but it is simply too massive to carry around every day. I still use it to carry equipment for big shoots, and at some point it will become my RedRock Micro DSLR rig case. If you need a giant bag, this one certainly meets that requirement, just don't try and carry it with you every day. The massive Tamrac 619 / Super Pro 19 with a 77mm lens cap provided for scale. Here is a photo I took. As you can see it depicts a sprawling oil refinery and a huge amount of sky above it. I took it riding in a car on the freeway.